I have found back my old good book of bread recipes of Hamelman. Searching between the pages I realized I skipped a recipe with preferment made with rye, 2 things that I like very much: Preferment, because it adds more flavor and taste to the bread, and rye because of its special aroma. I have prepared these with the idea to give one to a friend of mine, but as always, when I make a bread with a specific purpose something needs to turn not as perfect as you wished to be. In this case, I have not let enough time for the dough to rise and I put it in the oven a bit too soon.The loaves raised but not so spectacularly. In the end, I decided to keep them for myself and I'll give a better one to my friend from my future bakes. The breads received an interesting nice shape, looking more like a boat, being raised more from the sides. When I look at them, I do not know why, my mind travels to Venice and their gondolas. It's just my mind :) The taste was incredible, remembering of a country bread, strongly flavored with rye aroma. As for the stencil, because yes, this is one of my latest obsession, I have used one made by myself. How? I took a transparent plastic sheet and cut the model I had previously printed on a paper. When finishing, I have used both pieces: the one cut that I have used for the bread in the middle and the remaining plastic sheet with the model cut that I used for the breads positioned on the sides. Make the preferment 12-16 hours before. Let it sit at 21ºC. Mix all ingredients for 15 minutes. The first minutes should be on a lower speed then increase to the second speed. Final fermentation in floured bannetons for 1h30 at 24ºC. Bake for 15" at 260ºC in the preheated oven then reduce to 220ºC and continue to bake for 30 minutes. This recipe was adapted from Bread: A Baker's Book of Techniques and Recipes - Jeffrey Hamelman, page 262-263. 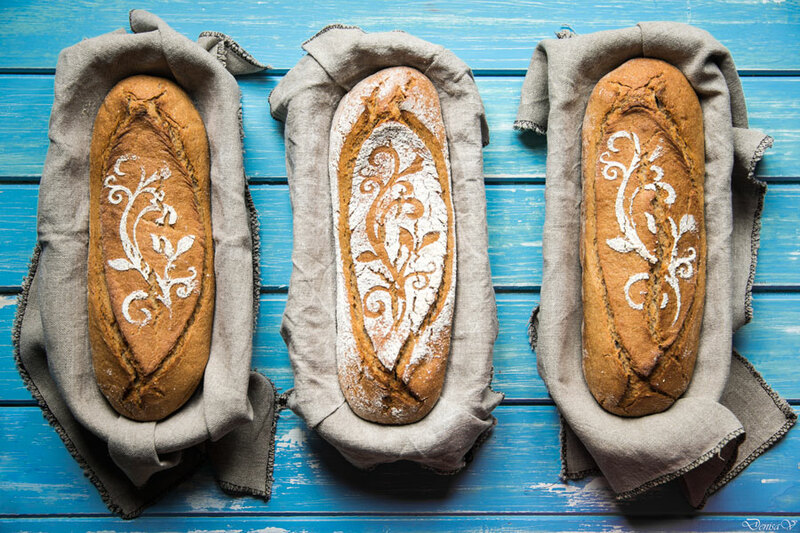 The loaves look simply gorgeous ! Thank you very much, Jelena.